And the location of the hotel is ideal, just a short walk to the beach of Stavro to the west, and less than one kilometer to the center of Tinos Town to the east. There are a total of only 12 units. Five double rooms are without cooking facilities, but with fridge, TV, A/C and balcony. There is one mini suite with kitchenette for 2 pax, and four junior suites, also with kitchenettes, which can accommodate 2 to 4 pax. Additionally, there are two spacious suites, the Romantic Suite and the Altana Suite, which include both kitchenettes and fireplaces. The larger Altana Suite also has two baths, two TVs and two balconies. One of the doubles and one of the suites have sea view, and all of the others have a quiet, sublime mountain view. All rooms have wireless Internet access, plus all the standard amenities of A/C, TV, telephone, hairdryer, safe, private bath with bath amenities, balcony. The hotel offers an expanded continental breakfast, served buffet style in an elegant dining area, just off the reception. There is also a splash/plunge pool as part of the outdoor decor. The architecture and interior design is all very Cycladic/Mykonian in style; all rooms having beamed ceilings and many have wooden floors. (Please have a look at the photos and the relevant Photo Album). Other features include room service; coffees, drinks and snacks available throughout the day; plus private parking on the premises. This is a good option for folks who desire self-catering facilities within walking distance of the town. 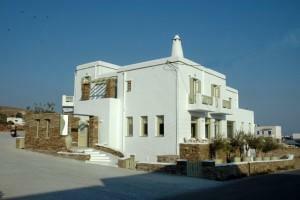 The Altana Hotel is on the seaside road to Kionia, about 700 meters from the Tinos main port and town.